A gluten free pizza with 3 cheeses and loads of rucola leaves fresh from the garden. 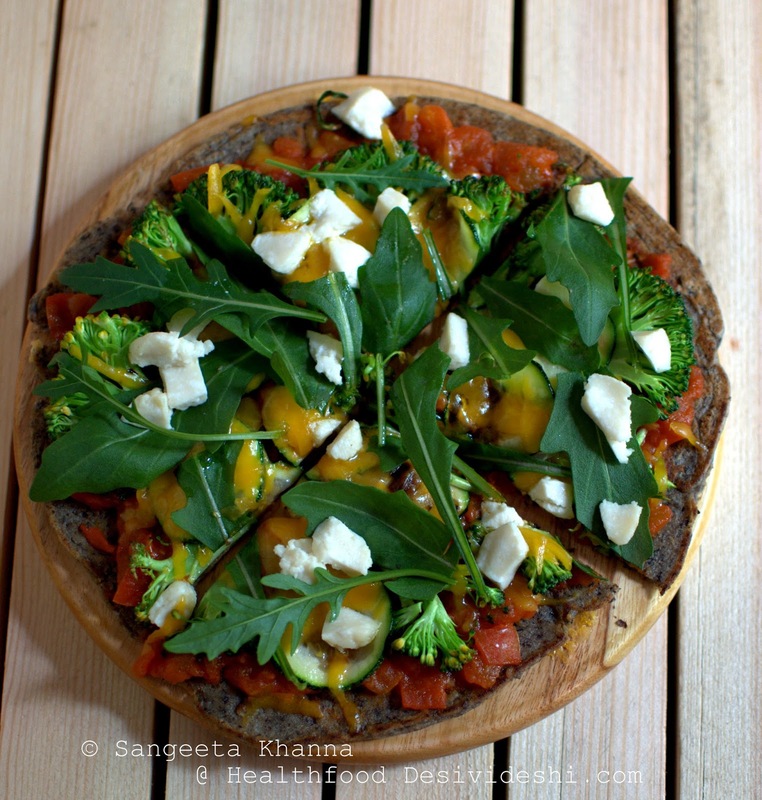 I have been making this easy gluten free pizza for some time now but it so happens that it always makes a quick dinner and the dark pizza base look horrible in artificial light. Also, this time around I had the gorgeous rucola from my garden and it deserved some show off. Buckwheat flour makes wonderful pizza base, the flour binds well, develops nice porous texture when combined with leavening agents and responds well to yeast as well. 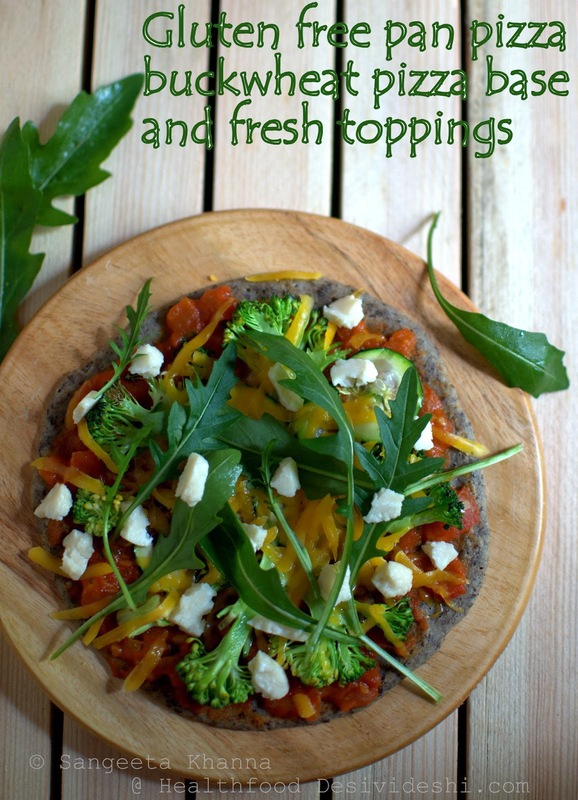 I love the way it can be made into an instant pizza base with minimal ingredients. Just some yogurt, some soda bicarb, salt and a little whipping done, the thick sticky batter is ready for pizza bases. And the important information is, that this pizza is cooked in a pan and not baked in an oven. Many of my readers keep writing to me to post recipes that can be done without an oven. 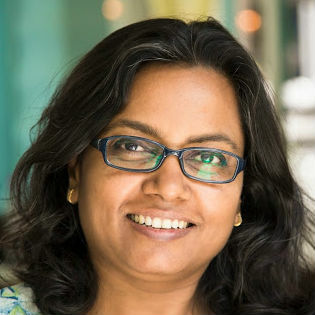 I know most Indian families don't use oven much even if they have one in the kitchen. Pan cooking feels more comfortable as our everyday food is mostly done on the stove. This pizza can be done in a pan as well as in an oven. The blind baking of the base is very important if you do it in the oven. A nicely baked based behaves well when the sauce is spread, and then the topping are sprinkled. For this gluten free pizza I just sprinkled the toppings liberally and served the pizza right away. No baking after the toppings have been spread on it. Of course the vegetables were seasoned and grilled on the pan in advance. So if baking in the oven, make sure to bake the pancake like pizza base completely before spreading the tomato sauce so you can spread fresh ingredients like this pizza. If you want to bake the pizza with mozzarella cheese on top, you can go ahead and bake or grill it on the top shelf for a couple of minutes till the cheese melts. I have not use mozzarella here. A deep yellow cheddar cheese, a home made feta cheese and some parmesan in the home made tomato based pizza sauce. Slice broccoli and zucchini if you want a pizza like this, or use any vegetables sliced or julienne or even chopped in small bits. whatever way you like. Aubergine slices work really really well. Use just tomatoes and onion rings if you have only the staples. Just use any vegetables you like. Or add some cooked shredded chicken breast, dressed like a salad or seasoned the way you like. I wont mind some cooked flakes of fish or well seasoned and blanched shrimps as well. You just have to pan grill the vegetables or meats or seafood for a couple of minutes, on a greased pan of course. Use olive oil or butter or ghee to grease the pan. Season them with salt and pepper, some garlic powder and may be some chilly flakes if you like. The base of the pizza is buckwheat flour as I said. If you make it using the instant way to make a pizza base with yogurt and soda bi carb, the pizza is a matter of 30 minutes. If you want to make the yeasted dough, you would need a few hours preparation time. 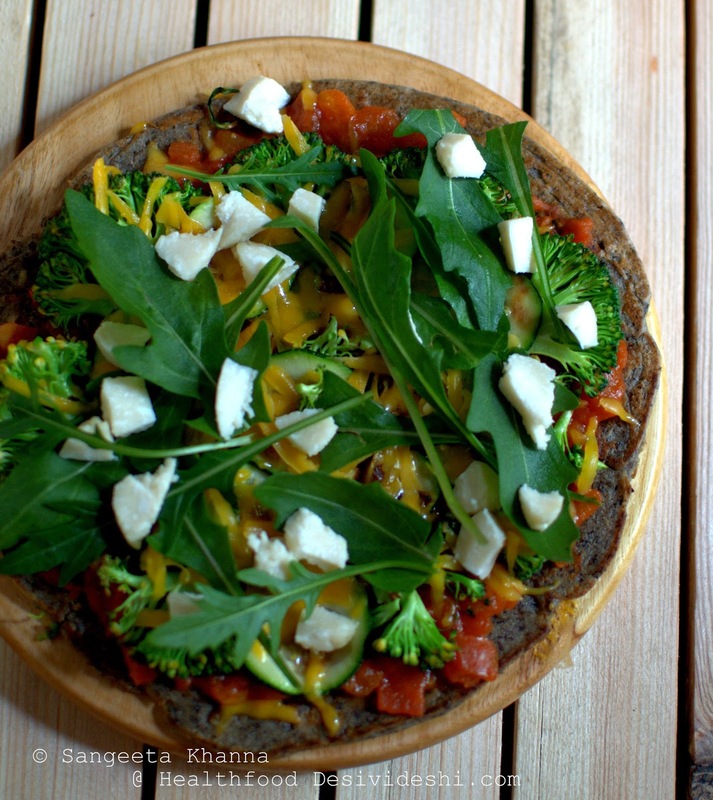 This recipe is the instant buckwheat pizza. Make a thick sticky batter by mixing a cup of buckwheat flour with 1/2 tsp soda bicarb, 1/2 tsp salt first and then with a cup of thick yogurt. Whisk till a smooth but sticky thick batter if formed. Let it rest for 15 minutes, this batter can be refrigerated overnight too. This recipe yields about 4-5 large pizza bases. Grease a frying pan with olive oil. Pour a ladle full of batter onto it and spread it lightly in a 1/2 cm thick pancake, as big or small as you want. Let it cook till the top gets firm, flip and cook it on the other side. Spread the tomato sauce, grilled vegetables and the cheeses over the pizza while it is still on the pan. The cheese starts melting. 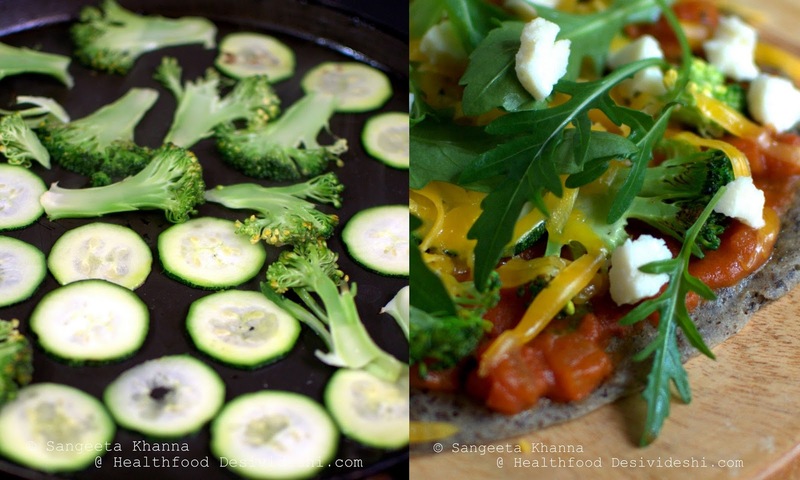 Use a wide spatula to transfer the pizza to a serving plate and spread fresh rucola or any leafy greens if you like. To make the homemade tomato sauce for pizza use this recipe of tomato concasse and mix 1 tbsp parmesan cheese to a cup of tomato concasse and use to spread liberally over the pizza. To prepare the vegetables season them well and grill the way you like, the procedure is mentioned above. Spread the vegetables liberally over the cooked pizza base. Top with more cheeses of your choice, bake again or keep it as it is, sprinkle fresh basil of rucola and enjoy. This is one pizza we eat in the kitchen itself. It never comes to the table. Only gobi parantha and momos are the other few foods that have this proud privilege of being devoured as soon as it is cooked. Gets over within minutes, resulting into happy smiles. This pizza looks really really good! I love how you have put lots of veges on it too.